Help us locate and identify the men shown in this gallery. Upload your stories and photos from Tet. Donate - To date, this project has been self-funded. Your donation will help fund a dynamic, online gallery of survival accounts and photos to compliment the Newseum exhibition. The Marines and Tet exhibit debuted January 26th at the Newseum in Washington DC. Sponsored by the National Federation of the Blind and Nikon, the exhibition features 20 photographs taken during the Battle of Hue in February 1968. Accompanying many of the photos are audio accounts of the house-to-house combat as told by the Marines that fought the battle of Hue. We wish to thank the Newseum, Stars and Stripes and 3DPhotoWorks for their incredible support in making this exhibit possible. A special thanks goes to the Marines and U.S. Army Surgeon, Capt. Mayer Katz for their audio contributions to the exhibit. At 3:00 a.m., January 31, 1968, 70,000 North Vietnamese Army and Viet Cong guerrillas launched surprise attacks throughout Vietnam. 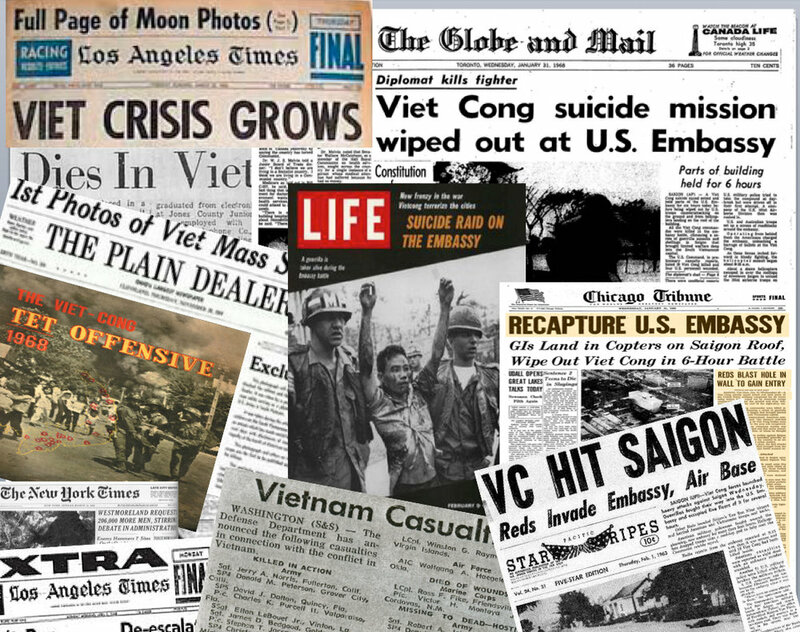 On this holiday morning known as Tet, more than 100 cities and outposts were attacked. In Saigon, a suicide squad penetrated and briefly held U.S. embassy grounds. Fighting was fierce. Throughout Vietnam, servicemen fought to survive. In 1968 I was a 20 year-old U.S. Army combat photographer. My photographs from the Tet Offensive were published in Stars and Stripes newspaper and LIFE Magazine. Forty-nine years later I have located and conducted audio interviews with many of the men I photographed in 1968. In 68, they were 18, 19 and 20 years old. Today, as men in their 70's, their experiences during Tet still haunt them. Many suffer from “missing time” as they witnessed things so painful, they’ve blocked much of it from their memory. For many, their audio interviews help the healing process. My goal is to locate and interview all of the men in my photos and the photos of those you can upload, and create a dynamic gallery to compliment the Commemorative 50th Anniversary Exhibition that I have organized in conjunction with Stars and Stripes and the Newseum in Washington DC. I ask for your help in locating the men I have been unable to find. • Museum Exhibition - Join us at the Newseum in Washingon, DC, January 26 though July 28, 2018. Celebrate the Veterans that fought the Tet Offensive throughout Vietnam in 1968. See these veterans in photos from 1968. Hear their recently recorded accounts of survival. Learn the impact Tet has had on their lives since 1968. • Locate and Interview (with your help) the “Missing Men from Tet” that we can’t locate. • Add your story. Submit stories and photos of family and friends. Help create a dynamic online gallery of veteran’s oral accounts. Grow the exhibition. • Help us locate and identify the men shown in this gallery. • Upload your stories and photos from Tet. • Donate - To date, this project has been self-funded. Your donation will help fund a dynamic, online gallery of survival accounts and photos to compliment the Newseum exhibition. Fifty years after the Tet Offensive, when the North Vietnamese army launched more than 100 surprise attacks across South Vietnam, see historic combat photographs of the U.S. Marines who fought a pivotal battle and hear their personal stories of the brutal conflict and how it shaped their lives. This innovative exhibition includes 20 large-format photographs and 10 tactile versions of the original photographs with touch-activated sensors that provide audio interviews with the Marines shown in the photos. The three-dimensional tactile prints allow blind and sighted people to experience the photography in a unique way. Ten Marines were interviewed for the exhibit, some of them revealing their stories publicly for the first time. 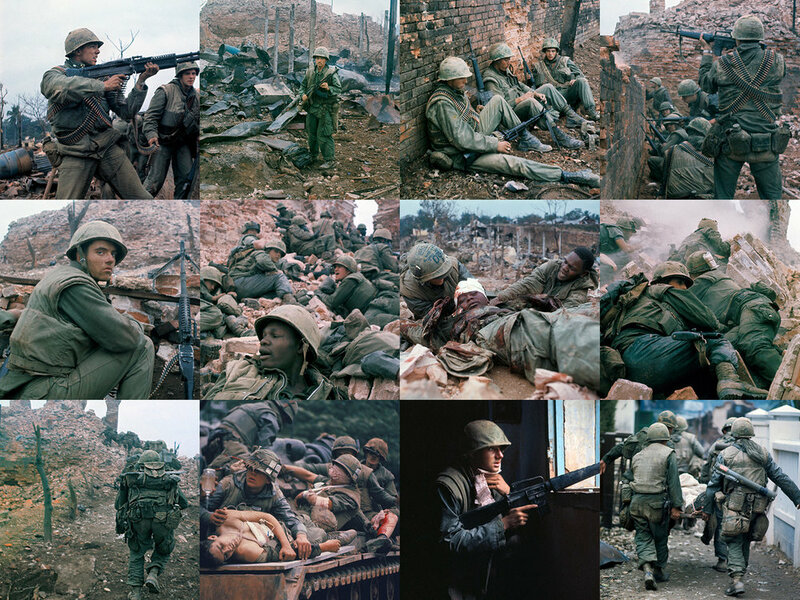 John Olson, then a young photographer with Stars and Stripes, spent three days with the Marines at the Battle of Huêˊ(pronounced Hway), the bloodiest single battle of the Tet Offensive and a turning point that changed the course of the Vietnam War. The battle of Huêˊ began Jan. 31, 1968, with intense fighting that left thousands dead and the historic city virtually destroyed before the North Vietnamese were driven out a month later. The exhibit was organized by photographer John Olson, who won the prestigious Robert Capa Award for his photographs from Vietnam and who at age 21 became the youngest staff photographer ever hired at Life magazine. The Newseum is the first museum in the United States to host a major tactile exhibit for blind and low-vision visitors. Do you have a story from Tet you are willing to share? Is there a story that your uncle, father or grandfather has told you that needs to be preserved? We welcome your stories and photos from Tet. Please send an email that summarizes your story to info@tet1968.com. We will be in touch. All combat photos herein were taken by John Olson. Audio interviews are told to John by the soldiers, marines and sailors shown in his photographs.